Today we're talking with Jess from The Elven Garden! I'm so excited to have her here today to talk about her paper piecing journey, especially her expert fabric choices. Give a quick, couple sentence bio of yourself. I'm a stay at home mum of three kids (2, 6 and 8), with a wonderful partner who listens to my talk endlessly about quilts. He actually has a pretty good quilting vocab now ;o). I started quilting nearly two years ago, and I'm completely obsessed - every spare minute I have while the kids are asleep (mostly at night) is spent in my tiny sewing room. You paper piece a lot of different blocks and patterns – what was your favorite one to do? Which is your favorite as a finished project? I think my favorite block I've made is the feathers block as part of the Forest QAL. This was designed by the brilliant Joanna aka Shapemoth. It was incredibly hard to choose fabric for this one, but I love how it turned out. My favorite as a finished project is my Reflected Textures pillow. This is made using a paper pieced block called Tippecanoe, and the pattern can be found in Issue 11 of Fat Quarterly ezine. What keeps drawing me back to your paper pieced blocks is your fabric choice (like your feathers block). How do you go about choosing fabrics for your projects? Thanks Amy! That is a really hard question. I like to use a lot of textured fabric in my paper piecing - think Architextures, Quilters Linen by Robert Kaufmann, and Sketch fabrics by Timeless Treasures. 90% of the time I choose small prints - I tend not to use large prints, unless I'm fussy cutting particular motifs, or sometimes in large sections (as in my Woodpecker block, see below). I chose the background fabric specifically to give a sense of movement. I think most of the time I spend a lot more time choosing fabric than actually putting together my blocks! Also, something that I try to do for all my quilting (not just paper pieced blocks) is use several different shades and tones of the same colour. For example the reds I used in the feather block encompass reds, orange-reds and both light and dark reds. This tends to give blocks a bit more interest, I think. I love the precision you can get from paper piecing that isn't possible all the time with traditional piecing. I love the challenge of putting together teeny tiny pieces of fabric, and making them into a picture, or piecing a really intricate block. I'm finding myself doing more and more paper piecing these days! At what point in the paper piecing process do you like to remove your fabrics? Do you use any special tools to help you paper piece? Starch, rulers, etc.? I actually don't use anything special. I normally do use starch, but tend not to for paper piecing. As for rulers, I just use the 1/4" marking on my normal ruler when trimming my block sections down. I pin my first piece of fabric to the paper rather than use glue (although that's mostly because I don't actually own the right sort of glue, lol). When and what was your first paper piecing project? How was that experience? 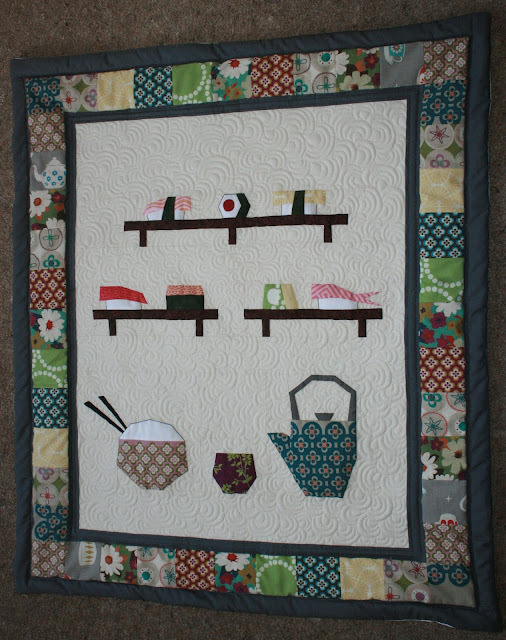 My first paper piecing project was pattern testing Sonia's (Artisania) Sushi quilt last year. She is an amazing paper piecing designer, and it was such a great introduction to paper piecing - she has some really great video tutorials on her blog, and the pattern itself is a beginner level pattern, so it was the perfect introduction. Thanks so much Jess, it was great to learn more about your process!